PHP developers form one of the largest and most active developer communities. PHP technology has numerous tools for almost any programming task imaginable, including a plethora of web development frameworks. This has led to incredible technology diversity among companies that use PHP or hire dedicated PHP developers. You are as likely to find a company with a Symfony developer team, while a similar company will opt for Zend, CakePHP, or another framework for its projects. In this post, we will take a look at Zend development, it’s effectiveness and specific features that can make your project stand out from others. Zend is one of the oldest and PHP frameworks that uses an open-source BSD-style license and is still in high demand. This makes it unrestrictive to use, modify, and repackage the framework code It was launched in 2006 by the Zend Technologies company. By this time, being a package of professional PHP packages, Zend Framework got more than 345 million installations. This technology is used for a wide range of projects from web applications to fully independent services based on PHP 5.6+ with object-oriented code with a great number of language options available. Comparing to previous versions of Zend Framework, they were downloaded 15 million times only that says of a significant upgrade of the technology last year. supports PSR-7 interfaces for HTTP messages. It is worth noting that the technology is provided by Zend that is owned by a Rogue Wave Company, but a number of developed components and added features were created with a help of support of Zend developers community and contributors. Zend technology is known for one of the most supportive and responsive programming community that cooperates on forums, IRC channels, and even group chats. Such famous companies like Google, Microsoft, and Sound Strategies PR use Zend development for building web interfaces and applications and nowadays, there are 12,348 companies in total referring to Zend software development. A full statistics on Zend technology usage you can find here. Therefore, based on the experience of successful companies, hiring Zend certified developers can greatly improve your PHP projects by allowing you to develop high-quality web applications faster. In the absence of Zend, your team might struggle on settling on a proven and tested development standard. Zend framework proved to be all-in-one solution for PHP-based projects. Looking to Hire Zend Developers? According to Zend Framework blog, the latest release of Expressive 3 was launched on March 16, 2018. On the date of this release, it was informed that Expressive 3 requires at least PHP 7.1. A few months later, developers launched Expressive 3 complete version that can support all components of PHP 7.2 and connect to Apigilty modules. Now, the company works on finalizing and updating existing API-related modules for Expressive 3 version and plans to complete this task in the nearest months. In the latest release, Zend creators improved type-hinting feature making it easier to use and more intuitive. Also, return type hints got an easier application building as well. Fully supporting PSR-15 framework standard, Zend Expressive 3 become related to a group of Middleware and Request Handler utilities. The base package was changed a lot: now if operated coordinating actions only, while a greater part of the code itself was put in a semantic affiliation or moved to a newly created packages. The base package is responsible for a user-friendly interface that helps to build application routes and pipeline. It worth noting that command line tools were improved as well allowing programmers to use the features in a simpler way. The updated creating request handlers and template support were reconsidered based on programmers’ feedback. zend-problem-details send responses for customer’s APIs, in both JSON and XML formats. It can be clearly seen that the latest, third version of Zend framework was updated and extended based on requests and suggestions of Zend programmers community. This way, the framework became more powerful and useful in terms of a variety of features and possibilities. No wonder that the number of Zend developers grows each year accordingly. What Are the Advantages of Using Zend Technology? It is easy to find a company offering Zend development services around the world. Since PHP is used widely by many businesses, this has led to a large community of development services and, thus, made it quite easy to hire PHP Zend developer. Working with a Zend development company is a great way to obtain quality software built quickly and reliably. If you would prefer not to delegate the development of your software to another company, then you should hire Zend framework developer. Well Structured Code. Working with this framework results in well-structured code. The framework makes this much easier to achieve than when rolling your own solution from scratch. With this comes the ability to add features to an application quickly and easily. Integrating new functionality into a well-structured code-base follows a logical process along well-established integration points. Reduce Technology Risk. Hire Zend developers to mitigate technical risks. If you are used to operating within strict terms where each hour counts, you definitely cannot afford failure to implement features and it is the Zend programmer is the exact coder you need. A small team of developers that knows the framework well can be more effective than a larger team using alternatives. This is because the long-running history of Zend programming has created one of the most stable PHP software libraries. You are less likely to run into bugs in the framework itself than with a newer, less well-tried framework. The salary of a Zend developer varies widely depending on location. This is one reason why it can be so beneficial for a client to look abroad when hunting for talent. Taking into consideration the US and Canada specialists, a Zend certified engineer salary reaches $69,683 and C$63,860 ($48,137) accordingly. Despite the fact that Zend developer salary in New York is higher than in Illinois or Texas, the range is not that big. Therefore, many companies tend to hire remote programmers from Western Europe. In London, for example, a Zend developer earns an average GBP 45,000 according to ITJobsWatch. This amounts to approximately $57,821 at current exchange rates. According to Stack Overflow, the average Zend development cost for Germany is around $41,400. In Poland, on the other hand, Zend salary is around $33,000 based on estimates from salaries posted on 4Programmers.net. Besides the US, rates of Western Europe programmers are pretty high as well. But there is one country known for exceptional experts in Zend development for hire. In Ukraine, Zend certified programmer cost is an approximately $23,601 based on Payscale data. At the same time, Ukrainian developers are one of the most demanded in-house and remote programming specialists all over the globe. Why hire a Zend developer in Ukraine? Of course, to get a great looking and working project at an affordable cost and short time. In order to hire Zend programmer talent or find PHP developers for hire, you should consider the following ways in which you can accomplish this. If you are in search of a strong example of Zend developer CV to take into account, check a resume pool here. Also, you can check there an average Zend developer salary on the market. If you wonder what vital skills should a reliable Zend programmer, this paragraph will help you to understand what you need to look for in resumes and CVs when hiring a coding specialist. In general, Zend developers have a wide range of knowledge that will help any PHP software development project. Besides the experience with Zend technology, these developers need to master a number of other skills such as HTML, CSS, XML, web services, NoSQL, etc., which work with Zend applications. When evaluating a Zend developer, you need to look for the following combination of skills: Experience with object-oriented PHP code. Zend uses the object-oriented features of PHP to make composing large applications clean and effective. Developers who know the web framework, therefore, will be able to organize code using object-oriented interfaces which result in better applications. The applications from such code will be easy to maintain or refactor in the future. Database interoperability with MySQL, SQL Server, PostgreSQL. Zend developer can integrate your PHP applications with a range of databases. These include MySQL, PostgreSQL, MariaDB, and Oracle. With such broad interop capability, you can use the framework with your existing database. Regardless of how your database changes in the future, this web app framework is in a great position to support any new databases you might need. Of course, Zend developer salary depends on the number of frameworks and databases he is experienced with. REST, APIs and JSON knowledge. Developers skilled in a major framework like Zend bring the experience of working with modern web app standards. For example, the framework encourages the use of logical, attractive URL schemes. This is one example in which the framework improves the experience of users of applications built with the framework. Good Zend developers are highly sensitive to these standards because the framework is replete with such a focus on modern ways. The use of REST, along with JSON and other API development is another modern standard that Zend developers should be familiar with. Now, you know what skills and knowledge should a well-qualified Zend programmer have. It is time to look for a remarkable specialist and finally hire Zend framework developer to contribute to your project. You have already noted about Ukrainian coders, right? 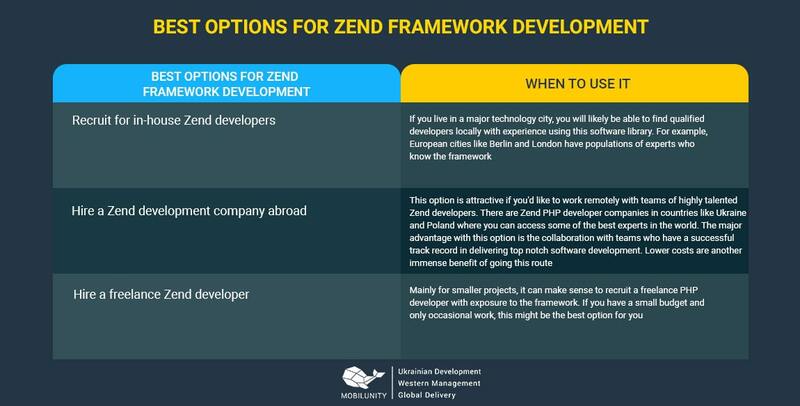 Is It Easy to Hire Zend Framework Developer in Ukraine? Though Zend is not a wide-spread technology and requires special subject matter specialists, there is a number of Ukrainian Zend developers looking for project development to start or join. It is important to note that many Zend programmers tend to work in teams within development companies in Ukraine. Therefore, if you need an experienced and reputable Zend coder, take a look at Ukrainian development companies working on projects on outsourcing. You can concentrate on the project in general and core activities. You don’t need to learn a new technology by yourself. You don’t need to hire an in-house programmer for one-time work or project. You can choose among a number of highly qualified remote specialists. You can hire an experienced remote Zend programmer at lower costs than in-house one requires. In-house and remote combined teams proved to be more effective, than just in-house one. You can get a fresh look at your developed project. And this list can be continued with a number of other benefits that Outstaffing brings, so it is a wise decision to fin, and hire an experienced and highly qualified Zend software developer to assist you in building your project. Consider yourself fortunate to have already found a team of highly qualified professionals in Zend development. Mobilunity is one of the most reliable and fast growing development company in Ukraine with a number of successfully launched projects and developed applications. Our dedicated team of Zend coders will gladly help you with development tasks and the final product will be forthcoming. Hire Zend framework developer in Ukraine with Mobilunity! Our team would love to help you with all your development needs. Have any questions – feel free to contact us!